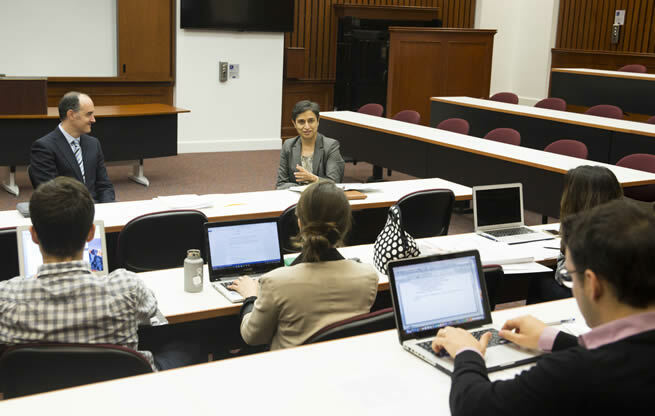 Adjunct professor Alfonso López de la Osa Escribano and Madhu Purewal, a senior legal officer and director in institutional compliance at the MD Anderson Cancer Center, discuss protections on human research subjects during a recent course at the University of Houston Law Center. June 19, 2017 – University of Houston Law Center students compared and contrasted U.S. legal health systems with some of its European counterparts this semester in Alfonso López de la Osa Escribano's comparative law class. Lopez de la Osa Escribano is an adjunct professor and the Director of the Law Center's Center for U.S. and Mexican Law. The course, from the Law Center's Health Law & Policy Institute, featured guest speakers from MD Anderson who specialize in the area where law and healthcare intersect. Students also studied legal and health systems in Belgium, Brazil, France, Italy, New Zealand, Spain and the U.K.
"I'm glad our students were able to take advantage of learning directly from M.D. Anderson experts in HIPPA, end of life and patients' rights, protection of human subjects, human tissues and body parts and medical malpractice in the U.S., as well as learning how other countries legal systems work in issues related to health law," López de la Osa Escribano said. Krista Barnes, a senior legal officer in institutional compliance at the MD Anderson Cancer Center, was the first visitor to the class. Barnes is an expert in medical records and data protection legislation and discussed legal issues surrounding medical records, data protection, and patients' rights to their own medical information. Barnes said that the process of de-identifying the patient information of someone who participated in a health study is not a simple task in the U.S., according to legal standards set by HIPPA. "To piece things back together and identify the patient would be extremely difficult, almost impossible, for someone other than the people with authority to use that data," she said. "Yet, this is the standard we operate under, and it makes it difficult for people to use that data for useful purposes like research without a significant amount of effort and legal burden." López de la Osa Escribano pointed to how the European Union (EU) adopted recently the General Data Protection Regulation in 2016, that will come into force in May 2018. Part of the regulation is to process and grant the free movement of data throughout the European Union. He said this EU regulation offers flexibility through a pseudonymization process where "personal data can no longer be attributed to a specific human subject". "This legislation parallels certain aspects of U.S. legislation on medical records, data protection, and patient's rights and offers a key insight into where we can find convergence in the two systems." Holly Rumbaugh, managing legal officer for litigation, patient care and hospital operations at the MD Anderson Cancer Center, joined López de la Osa Escribano's class for a discussion on the right to information and informed consent. "Patients have the right to choose what is best for their body," Rumbaugh said. "The informed consent document is much more than a form. It is a whole process of dialogue and trust between patient and physician, to communicate risks and benefits of the proposed treatment and allow the patient to have questions completely asked and answered, and they can decide freely." López de la Osa Escribano compared the U.S. system on informed consent and patients' rights to similar regulations in France and Spain. However, there are a number of slight deviations. "Exceptions to informed consent occur when a public health risk exists, during an emergency situation, in some research situations or if a person is incompetent and unable to contact his or her family or legal representative," he said. Rumbaugh also examined end of life legislation, and highlighted the significance of patients being able to issue advanced directives – instructions on how to proceed with medical care if a patient is unable to express their wishes. "To have advanced directives is always a good idea, even if doing so might cause discussions that are not always easy to address," she said. "Down the road if we are in a difficult medical decision and we can't speak for ourselves, they can be valuable." Rumbaugh explained other end of life medical situations like comfort or palliative care and assisted suicide which is illegal in Texas. López de la Osa Escribano brought up the legal framework of a number of European nations that do perform euthanasia or assisted suicide. "In Switzerland, according to the Swiss Criminal Code 115, assisted suicide is legal, but not euthanasia," he said. "Euthanasia has been legal in Belgium since 2002 and as recently in 2014 it is also legal for children of any age. In The Netherlands, it is legal for adults and children over the age of 12. Assisted suicide can also be performed in The Netherlands by a physician who meets the requirement of care, and informs the medical examiner. Euthanasia nor assisted suicide are legal in France or Spain." Madhu Purewal is a senior legal officer and director in institutional compliance at the MD Anderson Cancer Center. She delivered a lecture to López de la Osa Escribano's class on the protection of human subjects in research. She discussed several regulatory agencies that exist in the U.S. that are involved in this area. "The Office of Human Research Protections, the U.S. Food and Drug Administration and the Office of Civil Rights with their respective statutes regulate the protection of human subjects," she said. "There is also a federal mandate for Institutional Review Boards, which are like an independent research ethics committee. This grants the highest level of protection of human subjects involved in a research trial." López de la Osa Escribano said the U.S. has gradually become more similar to Europe as regulations protecting human subjects are becoming more protective of people, much like the European regulations. Dr. Tyron Hoover, the director of the biospecimen research office at MD Anderson, was the fourth speaker in adjunct professor Alfonso López de la Osa Escribano's comparative health law course. The final speaker was Dr. Tyron Hoover, the director of the biospecimen research office at MD Anderson. 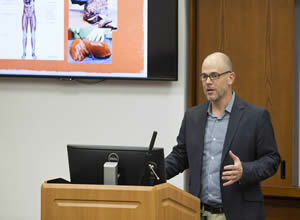 Hoover gave a talk on human tissues, organ donations and transplants and a separate lecture on medical malpractice. López de la Osa Escribano described how the legal status of body parts has dramatically evolved in recent years, due to the interest they arise in research and for treating diseases, the difference between blood, cells, organs and tissues was made, in order to grasp their particularities. "When it comes to tissues and body parts, legally the notion of ownership needs to be approached with a few questions," he said. "Do patients have a proprietary right on their cells, or do ethical concerns have to be taken into account to avoid that human bodies become a commodity? " Hoover discussed the 1990 case Moore v. Regents of the University of California, a landmark decision made by the Supreme Court of California in 1990. In this case, John Moore was a patient, who was treated of hairy cell leukemia by a doctor that recommended a splenectomy. "Moore signed an informed consent for medical intervention, but physicians removed parts of the spleen to produce a cell line without the knowledge of Moore," Hoover said. "During that time, Moore gave samples of blood, skin and bone marrow that ended up in developing a cell that valued at $3 billion. Years later, Moore was asked to sign a consent to allow the use of these tissues, blood, and cells. Moore refused to sign and filed a procedure for breach of fiduciary duty, lack of informed consent, and proprietary claim, as we know, for interference with the possessory and ownership interest in personal property, which is a strict liability." The Supreme Court of California judged that Moore could sue on the basis of lack of informed consent and for breach of fiduciary duty, but not on the basis of proprietary claim. As the Court said, "to recognize and enforce a right to sell one's own body tissue for profit" was asking much. In the following discussion on malpractice, Hoover provided analysis among other decisions on another landmark case of 1974, the Helling v. Carey, from the Supreme Court of Washington . The case involved two physicians who were found to be negligent while treating a glaucoma patient. Patients under the age of 40 rarely suffer from glaucoma, so the doctors neglected to give the patient a routine test. "Even though the doctors in question followed the standards of care, they were considered negligent when severe damages occurred to the patient because there are precautions so imperative that their universal disregard will not excuse their omission," Hoover said. "In that case, following the standard of care couldn't insulate the defendants from liability of negligence." López de la Osa Escribano concluded the discussion by examining the development of malpractice regulations in France and in Spain, constructed traditionally under the distinction between best-effort obligation (for curative medicine) vs. a performance obligation (for plastic surgery or comfort medicine). Thus, in 2009 the Supreme Court of Spain, operate a change of jurisprudence after linking a performance obligation with a prior engagement of the physician to grant a specific result.